In this guide we’ll take a look at the best collapsible laundry baskets. What Is The Best Collapsible Laundry Basket? The DOKEHOM Collapsible Laundry Basket is the best collapsible laundry basket if you don’t have room to store a conventional washing basket. The basket is 40.6 x 40.6 x 55.9 cm when extended and can be collapsed to almost flat. This makes it easy to store in a small space near your washing machine. This collapsible laundry basket is made from thick durable cotton and is also waterproof which keeps your clean washing spotless and protected from dirt and damp. The handles of this collapsible laundry basket are made of leather and riveted to the body of the basket with steel making them durable and strong. This enables you to carry large amounts of weight in the laundry basket without risking breaking the handles. The basket also has a drawstring lining that can be closed to help keep your clean washing protected and dust free. This laundry basket also works well as a storage option as the foldability means it can be tucked away when not required and the drawstring lining helps keep dust off your stored items. This is the best collapsible laundry basket as it can collapse to a very small size meaning it doesn’t take up much room. However, when extended it is thick, durable, waterproof and has strong well-secured handles. This makes it a great choice for families or anyone that needs to save on space but still needs a good, strong laundry basket. The Brabantia Collapsible Laundry Basket is another great collapsible laundry basket as its 42 x 25 x 36 cm size means it can hold plenty of washing, but it can be folded to almost flat making it great to store. This is a slightly smaller option but can easily hold a full load of washing. This basket folds flat and can pop itself up in seconds making it very quick and convenient to use. This collapsible laundry basket is waterproof helping to keep the water from wet washing in or, stopping your clean washing getting damp or dirty. This laundry basket is made of canvas but, has a solid base so once extended it is still very sturdy. Flexible wire allows the basket to fold but remain rigid when extended. 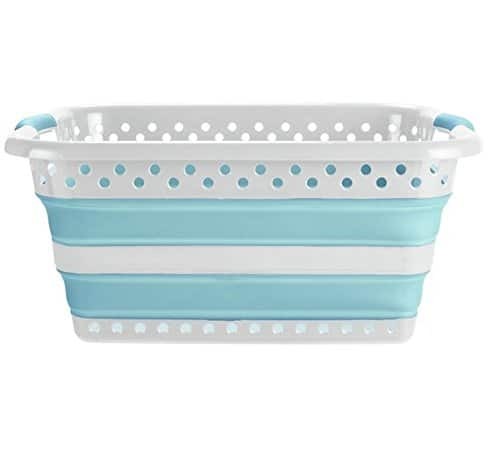 This is a great collapsible laundry basket for someone that has a small space to store their basket and doesn’t need a really large washing basket. The Addis Foldable Collapsible Laundry Basket is sized at 45 x 61 x 28 cm. This laundry basket is a mix of plastic and canvas and is very sturdy. It doesn’t fold completely flat so won’t fit into a very thin gap because of the plastic section. However, the plastic adds strength to the product making it sturdier and giving the basket longevity. This is a great foldable laundry basket for a family that needs a sturdy product that can stand the test of time. It is large and holds a lot of laundry but can still be tucked away due to its collapsibility. The Denny International Collapsible Laundry Basket is sized at 60.5 x 45.4 x 26.5cm and is made from a combination of plastic and canvas making it foldable but still hard wearing. This product is particularly lightweight whilst remaining large and is capable of holding multiple loads of laundry. This foldable laundry basket is great for someone that doesn’t have their washing machine in their home and must travel. Due to it being lightweight it can be transported easily and can hold multiple loads of washing making your trip to the launderette as efficient as possible. This Beldray Collapsible Laundry Basket is sized at 60 x 44 x 28 cm. It can fold away to almost flat enabling it to fit in the smallest of spaces for storage. This laundry basket is made from rigid plastic which gives it strength, and canvas that allows it to fold flat. This is a great collapsible laundry basket for someone living in a small flat or apartment. Its size allows it to be tucked away easily, but it does limit the amount of washing it can hold making this a good choice for a single person or couple.